felt the nip in the air, came in and immediately went to the kitchen to make soup. Easy clean-up: In addition to being a one spoon, one bowl meal, it’s usually also a one pot meal. I started cooking soup meals when my dad was on Chemo. 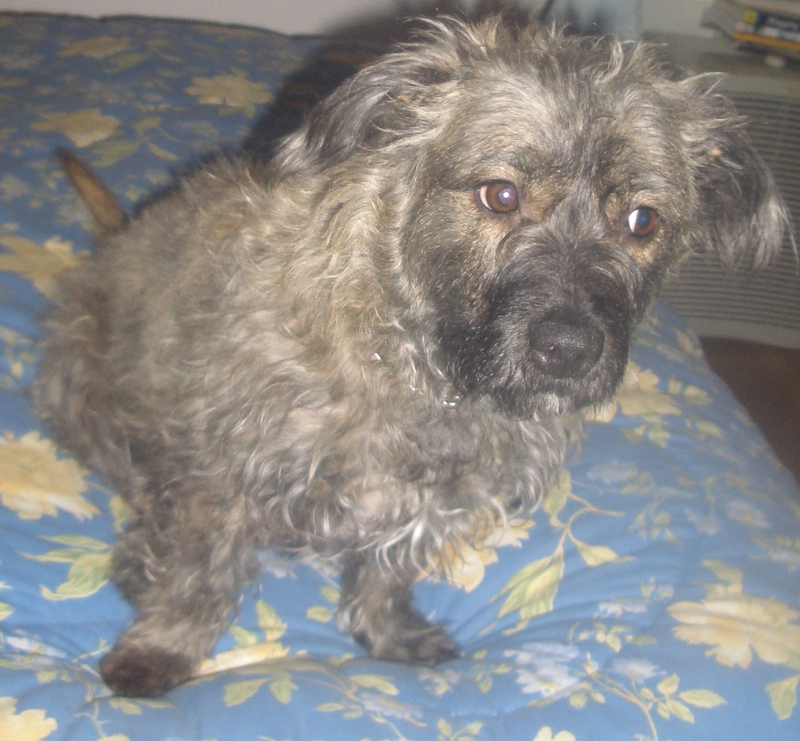 His taste buds and appetite had changed; food no longer interested him and he was just getting thinner and thinner. 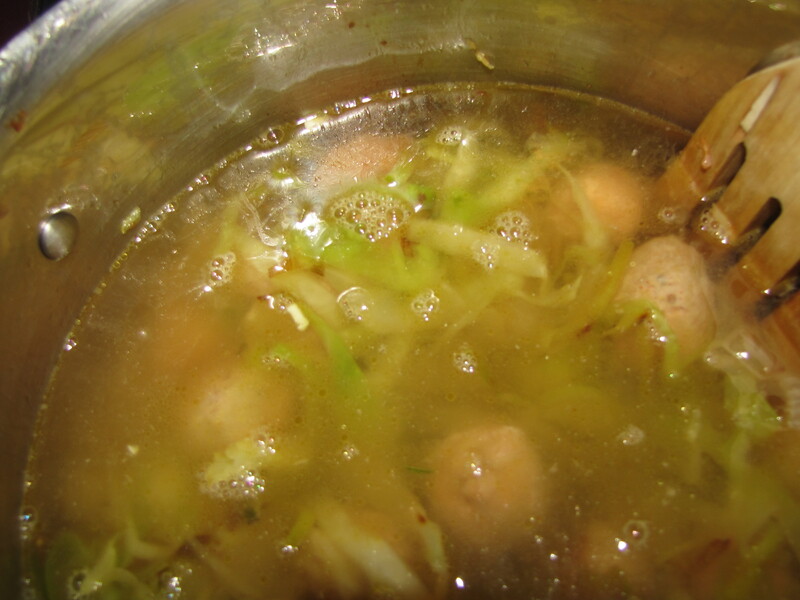 He was, however, willing to eat soup – so I would “hide” lots of small pieces of meat or chicken and some kind of starch (rice or barley or potatoes) in my soups and he would eat the whole thing. If you have a friend or loved one who is having a hard time eating, try a soup meal and see if it does the trick. 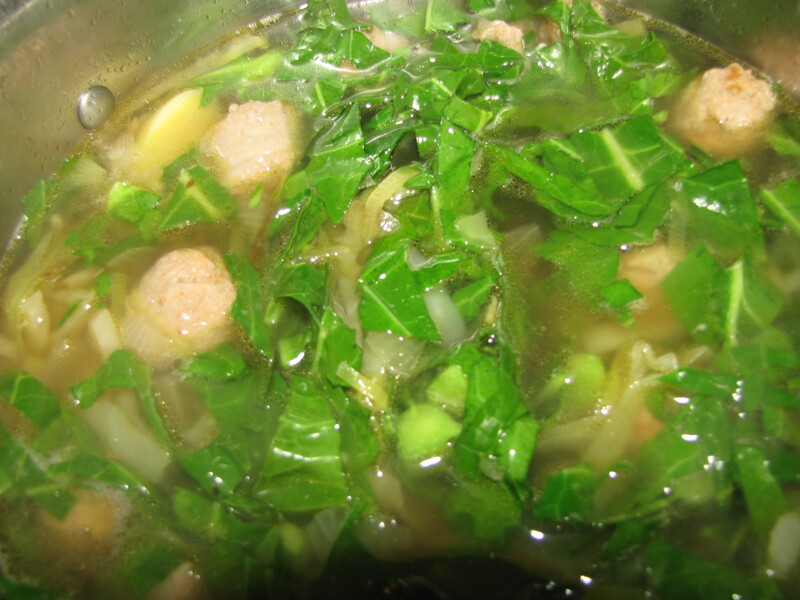 I adapted this soup from a recipe I wrote for “1,000 Vegetarian Recipes” – obviously there was no sausage or ham in that recipe, but I remember loving the combination of cabbage, greens, and potatoes. I used hot Italian sausages but I will warn you that the soup is pretty spicy – you may want to use sweet Italian sausages or some combination of the two (I’ve made this sometimes using turkey sausage and sometimes pork), but you can also use cooked sausages like Kielbassa or maybe even frankfurters or cured meats like corned beef or tongue (though I honestly haven’t tried any of those yet). In any case…look for more soup meals in the near future. 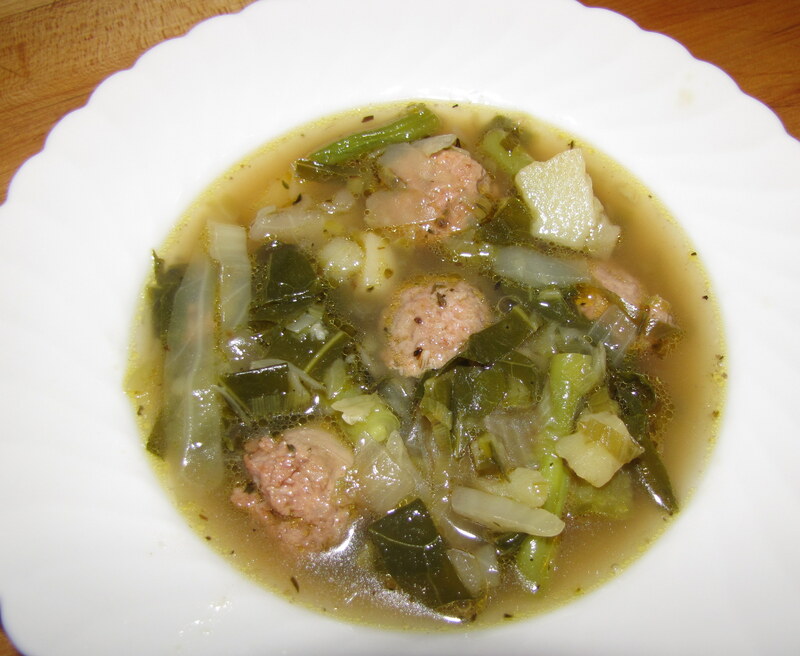 You can vary this soup by using any kind of greens instead of the collards (escarole is especially good), or you can use other vegetables instead of or in addition to the green beans. I’ve been know to use cauliflower, turnips, carrots, and zucchini or, let’s be honest, anything I have in the refrigerator that needs using. In a 4-quart pot, heat the oil over medium heat. 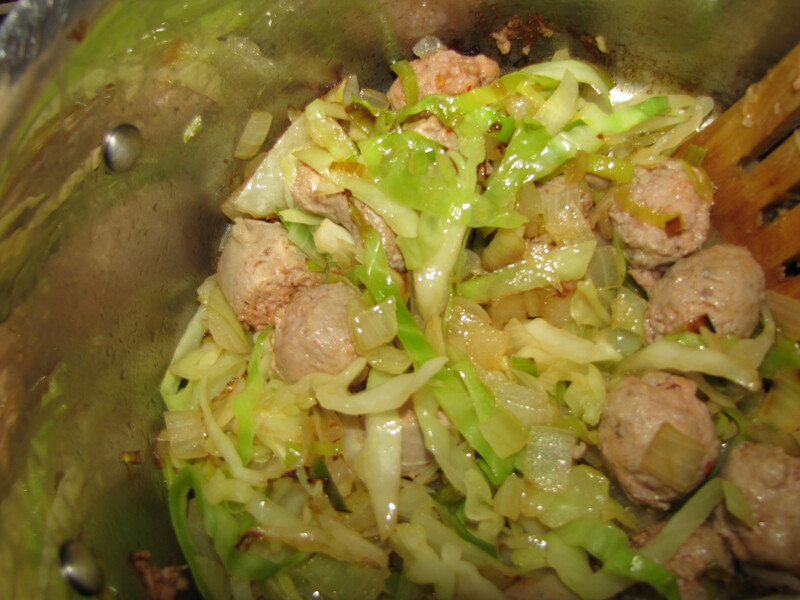 Add the onion, cabbage, leek, and garlic; cook stirring occasionally until the onions are softened. 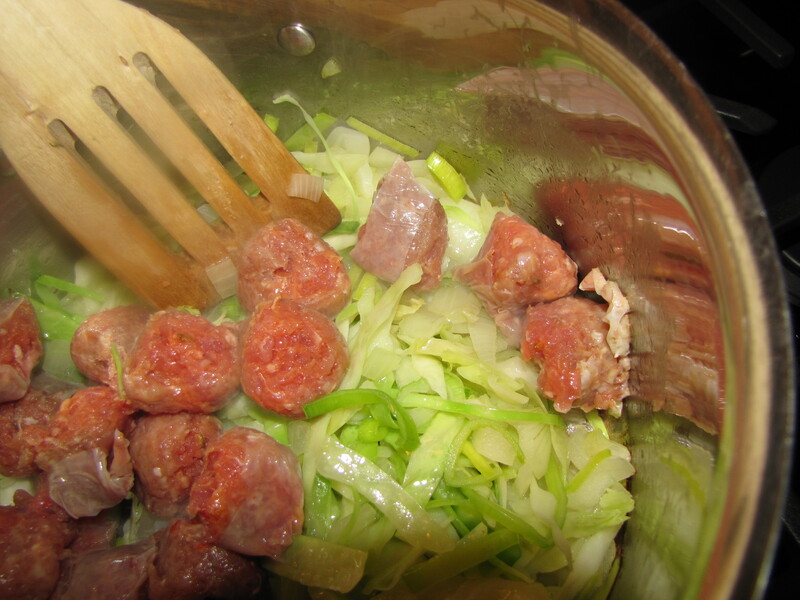 Add the sausage and cook until no longer pink. Add the broth and water; bring to a boil. Add the potatoes, collards, bay leaf, oregano, thyme and pepper. 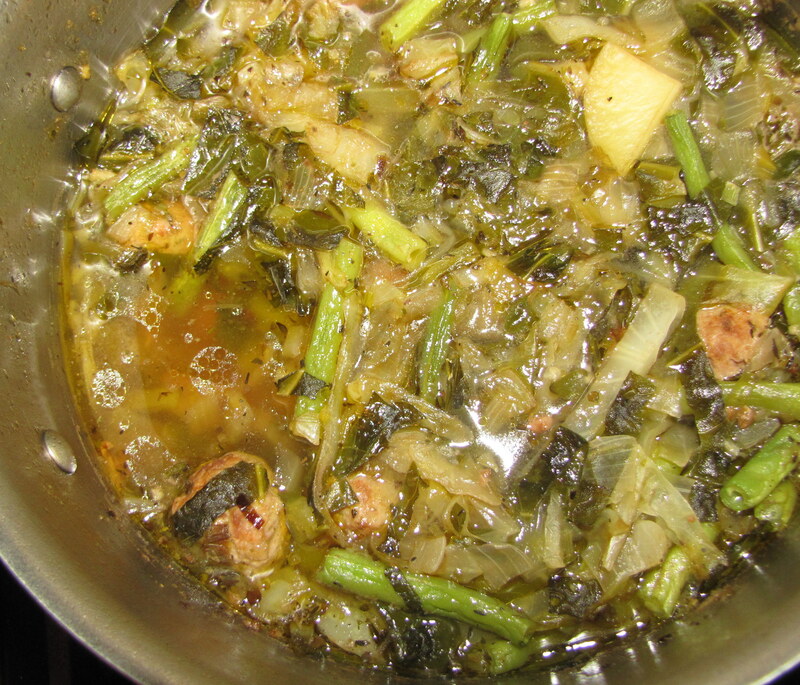 Bring to a boil; reduce heat and simmer, uncovered, 25 minutes. Discard bay leaf. I can attest to your soup’s total yumminess. I will definitely make it, and if the Philistines I live with won’t eat it, I’ll eat the whole thing. This reminds me of the Chinese variation: starchy potatoes replaced by rice or mung bean transparent vermicelli, chicken/ shrimp/ pork, sliced in thin strips, and maybe fresh cilantro leaves and a dash of toasted sesame seed oil at the end. PS. Question re cut of potatoes, chevrons – is that traditional in some cuisine, what are the advantages over cubes? The chevrons are not traditional to my knowledge. 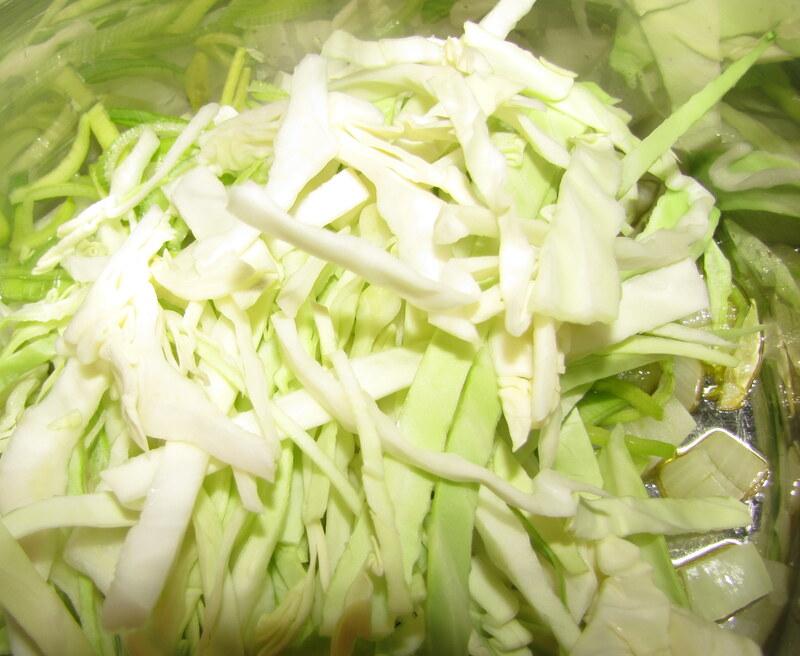 I like them because they disintegrate more easily than cubes – thus thickening the soup a little. The Chinese version sounds yummy. One pot cooking – excellent reminder, thanks!